A team of engineers and architects from the Massachusetts Institute of Technology (MIT) has won the top prize for architecture in 2017’s international Mars City Design competition, which asks participants to design habitats that could one day be built on the Red Planet. The competition, sponsored by both NASA and the European Space Agency (ESA), is one of many that asks participants to come up with creative solutions to the problems these agencies anticipate in the journey to Mars. MIT’s winning design, which the team calls Redwood Forest, is a collection of "tree habitats" connected through a system of tunnels called "roots." The roots would provide safe access to other tree habitats, private spaces and "shirt-sleeve transportation," according to a statement from MIT. The tunnels would also provide protection from cosmic radiation, micrometeorite impacts and extreme changes in temperature. Each dome-shaped tree habitat would house up to 50 people, and the team's vision calls for building about 200 of them, to support a settlement of 10,000 pioneers. The structures would include private and public spaces as well as plants and water harvested from the northern plains of Mars, according to the statement. "On Mars, our city will physically and functionally mimic a forest, using local Martian resources such as ice and water, regolith (or soil), and sun to support life," MIT postdoctoral researcher Valentina Sumini said in the statement. Sumini and MIT assistant professor Caitlin Mueller led the team, which also included nine students. "Designing a forest also symbolizes the potential for outward growth as nature spreads across the Martian landscape," Sumini added. Also like a forest, the "trees" in this collective would be vital in transporting water throughout the system. "Every tree habitat in Redwood Forest will collect energy from the sun and use it to process and transport the water throughout the tree, and every tree is designed as a water-rich environment," George Lordos, a Department of Aeronautics and Astronautics doctoral student who worked on the project, said in the same statement. Each dome would have soft cells that would fill with water to help protect inhabitants from radiation, manage heat loads and supply water to both fish and produce farms. 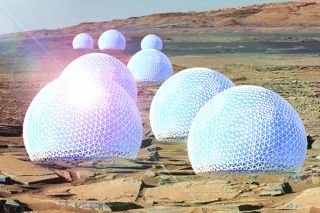 The domes would also have solar panels to generate clean energy for charging hydrogen fuel cells and splitting water to create rocket fuel, Lordos said. The Redwood Forest design could also have uses here on Earth, team members said. A similar architecture could make harsh environments like those at high altitudes and even the seafloor livable, they said in the statement, and the habitat’s proposed gardening system could cut down on land and transportation costs. Still, the goal of Mars City Design is ultimately to help agencies like NASA and ESA come up with viable ways for humans to settle the Red Planet. "It is not enough to just travel to Mars and survive; now we must develop a way in which we can sustainably live and love on Mars," the competition’s website reads. "It is essential that we call on a new generation of thinkers and innovators to make this a reality."